E-books are ideal for travellers, allowing a large selection of holiday reading to be carried in one slim pocket-sized device. They can transform sightseeing too. Whereas a traditional paper guidebook is a constant compromise - want detailed descriptions? then be prepared to carry a burden - e-books mean you can carry large amounts of information around at no inconvenience. The Italy Heaven Guide to Venice takes advantage of Kindle/Epub formats to provide an in-depth guide that doesn't skimp on any information, but doesn't weigh you down. Carry it in your pocket or bag, and dip into it whenever you want. If you are only in Venice for one day, try the one-day version of the guidebook. The book can be read on a selection of devices, meaning that for the price of one copy, you and your travelling companion could each carry the guidebook on your e-book devices or using an app on a smartphone - so no more waits for someone else to finish reading and hand the book over. 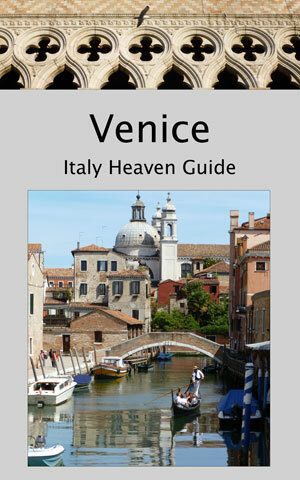 The guidebook contains seven walks around Venice, with detailed descriptions. They cover every district of Venice, all the town's big sights - and lots of lesser-known spots off the beaten track too. The walks are devised to avoid busy tourist lanes wherever possible, and to take the visitor along the loveliest and quietest canals, through characteristic local areas and past some of the city's best restaurants and cafes. Walks include A Dorsoduro Ramble, which leads the traveller through the pretty, arty district of Dorsoduro, along picturesque canals, romantic corners and a long sunny waterfront, via art galleries and restaurants. This is a laidback area, and the walk is ideal for enjoying at leisure, with breaks for art, ice-cream (try the famous Sicilian pistachio gelato at Lo Squero), lunch and photography. A large proportion of tourists in Venice end up in restaurants where they eat poor food and feel ripped off. This guidebook recommends good-value eateries where local people dine, bars where you can nibble traditional Venetian cicheti, and the best spots for vegetarians. There's also advice about ordering food, with Italian vocabulary and money-saving tips. Lovers of art and history will find detailed accounts of Venice's galleries, churches and museums, as well as contextual chapters providing background, which will help you to appreciate the city's heritage. From lagoon high tides to the art of the Renaissance, there is a wealth of information and curiosities to uncover. The guidebook can be used in as much depth as you choose. Whether you want practical advice on buying vaporetto tickets and finding your way, contact details for reliable restaurants, a guide to off-the-beaten-track parks or lagoon islands, or to locate paintings by a favourite artist, you will find answers here. Why are there cannonballs embedded in some of Venice's buildings? Do you really have to order that expensive starter? What's the best way to tackle art-sightseeing in Venice? What's a good place to propose? What restaurants are nearest to ferry stops? How can you entertain children? Where do Venetians go to escape the summer crowds? If you're not sure the guidebook is for you, read the free sample provided before you spend any money. Once you are in Venice, the tips provided in the book are likely to cover the cost of the guidebook, and save you much more besides (especially on food, one of Venice's biggest expenses). If you find the book helpful, please consider writing a brief comment on Amazon to help other travellers with their choice. Detailed maps are not included in the guidebook. Walk directions are designed to stand alone, but it is a good idea to pick up a paper map when you arrive in Venice. Free maps are usually available in hotels. If you plan to do much independent exploring, I'd suggest buying a more detailed folding map such as the pocket-sized all-weather Touring Editore Venezia-Venice 1:5.000 .